Heute kümmern wir uns um Musik, die sich aus dem Baukasten der Geschichte bedient. Die Vorstellung, dass sich nichts Neues mehr erfinden ließe, weil alles schon einmal da gewesen sei, stammt aus den 1970er Jahren und ist damit selbst schon wieder historisch. Trotzdem haben wir es derzeit wieder mit Musik voller Zitate und Referenzen zu tun – Golden Glades sucht sie aus und spielt sie ab, ohne gleich eine Theorie daraus bauen zu wollen. Die Jahreszeit gab eine treffliche Vorlage, denn goldene Lichtungen finden sich gerade und vornehmlich in freundlichen Herbstmomenten. Der Indian Summer – kristallblauer Himmel, Blätter in dramatischem Bordeaux – lässt sich zum Glück nicht nur in Neuengland, sondern auch anderswo bewundern. So lag es nahe, ein paar lichtdurchflutete Musikeinlagen zu sichten und sorgsam zu sortieren. Voilà, in der heutigen Sendung erleuchten Painted Hills, Aquaserge und Minimum Chips. Faith Healer Waiting Mint Rec. When the Reeperbahn Festival first started in 2006, I was actually part of the line-up with my band Kajak. And it was quite interesting for us to play, because it was not a common local gig: we played in Angie’s Night Club – a glamorous venue I never set foot in before. And during the show was not a single familiar face in the crowd. For me it felt like playing on a different planet, although my apartment was about 100m down the road. Canada is currently celebrating the 150th anniversary of its confederation and it was a smart move from the festival to set a focus on to this country, because it has a thriving music scene and lots of interesting acts to offer. Like Mo Kenney for instance: She and her comrades played a pretty tight and catchy power-pop set in the early afternoon. There were feet tapping and heads nodding across the room while Mo Kenney moved through her tunes with a certain easiness – I only wish she played a few more songs! 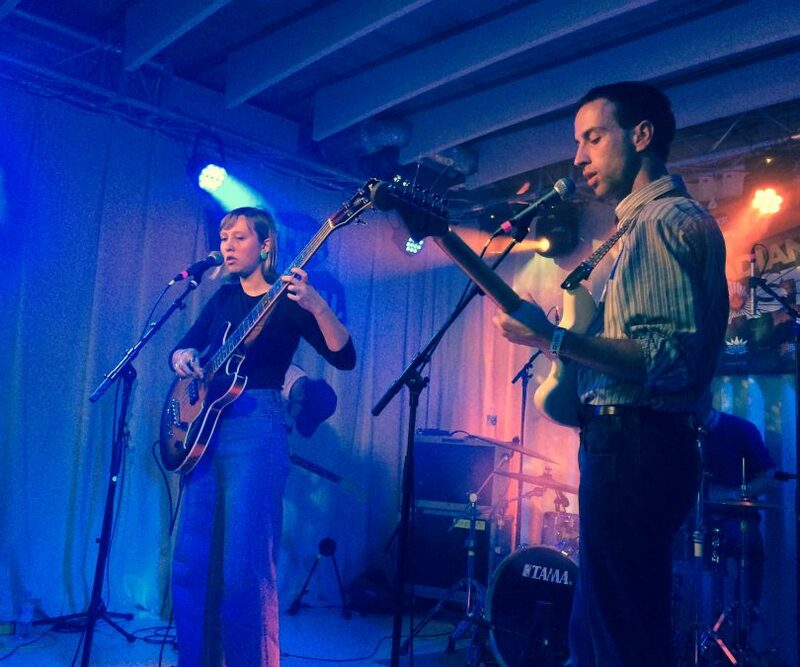 Next up was Mauno (see photo), also a band hailing from Nova Scotia. I set my golden ears on this act in 2015 when they released a batch of very first demo songs via Bandcamp and since that time the Canadian quartet defined a remarkable sound of their own: complex, but with a great sensibility for pop and dynamics. Initial sound problems plagued Mauno’s set as the power supply went off several times. And I’ve seen other bands getting nervous or angry about these kind of technical issues, but not here: Mauno didn’t mind to improvise, it’s part of their music and they handled the situation like experts: “The power’s telling us a lesson” said singer/guitarist Nick Everett at one point. “If you have power, use it wisely” – true words. In the end, they managed to play an elegant set of deconstructing pop with just the right amount of haunting intimacy. Watch out for their new album “Tuning”, to be released in October. After this first highlight it was time to hook up with my friend and colleague Alice Peters-Burns. If you’re not already familiar with her, please tune into her radio show Kaleidoskop on ByteFM or Offbeat via NovumFM. As well, she runs a fabulous blog where she features music off the beaten track. The first thing we witnessed in the eve was a new thing called Superorganism. The word is that this group comprised of eight members from all over the world and is fronted by a 17-year-old Japanese girl from Maine. Smells a bit like the next big thing? Well, Superorganism just got signed to Domino Records and here at the Reeperbahn Festival they were thrown in at the deep end by playing their very first live show in one of the bigger venues in town – and I can report: they didn’t sink, they did a pretty good job! If you’re a fan of infectious electropop tunes, you might love this buzz band Superorganism. Supported by visuals, playback und three punchy background singer/dancer, the show was colorful fun from start to finish. Alice and I floated on to King Creosote at the Imperial Theater. Here it was more than suitable to sit down in fluffy chairs while listening to the bard of Fife alias King Creosote who apparently, just shaved his head completely bald. Furthermore, his music was stripped down to a solo performance with acoustic guitar and voice only. He played a bunch of honest and wistful folksongs with lovely banter in between – all this worked well for King Creosote. Quite interesting was the response to Jane Weaver’s show late at night: some people grooved along to the music, others just closed their eyes to get lost in it. And both was fine. The elusive songwriter’s been making music for 20 years now and her latest release Modern Kosmology was an ambitious piece of unearthly psyche-pop and futurism. Surrounded on stage by a tight backing band with Kraftwerkian beats and analog sci-fi sounds, Jane Weaver had enough freedom to present her pop gestures in the likes of Kate Bush. It was a performance you don’t see very often these days and I was surprised, the club was not completely packed with people. Hopefully next time. The other night Marika Hackman rocked out with her band on quite a different level: no fancy dress or make-up like Jane Weaver, only basic t-shirts and simple hairstyles. But it fit perfectly to the 90ties inspired American slackersound she played, some of them in the spirit of Nirvana’s softer side. But still, the live sound was heavy enough to move and bob along with the songs, and especially the fan crowed upfront was really into it. Later on, the stage was invaded by All We Are, a trio based in Liverpool. I never really liked their records, but my friends Alice knew better as she met the band before. And indeed: the live sound was filled with energy and catchy hook lines. And I quite enjoyed the fact, that the drummer stood while playing. All We Are delivered top notch festival entertainment, although I left with a feeling that they were trying a little too hard to please everyone. Probably the best thing about visiting the Reeperbahn Festival is simply drifting along. All (70+) venues are within walking distance and there’s a lot of great stuff to discover. Of course, the schedule was packed and I missed quite a few acts I badly wanted to see. But as well I popped into unknown shows and made completely new discoveries. Thanks to that I fell in love with a French group named Aquaserge: they were mind-blewing! With five performers dressed in costumes, Aquaserge delivered a hypnotic show with analog keys and (bass-)clarinet. Lots of effect pedals served the psychedelic paradigm and when the polyphonic voices came into the mix, it felt like they’ve found the sixth sense of music. Imagine Stereolab with Tortoise as experimental jazzy shapeshifters, you may get an idea, what Aquaserge is about. Thank you, #RBF17, for putting on this great discovery and all the other fabulous artists. See next year at #RBF18!